Tea, coffee and cocoa are the three most popular drinks of the world. Drinking tea has become a fashion in both the East and the West, and many people have cultivated it into a hobby; therefore, many "tea cultures" are also formed in the world. Xishuangbanna is the production place of the famous Puer tea, and it has many famous mountains for producing tea in history, such as Mount Nannuo, Mount Youle, Mount Xiangming and Mount Yiwu etc. At the present, the people there discover many wild tea plants in the rain forests and a "king of tea plants" with an age of 800-900 years; these discoveries make Xishuangbanna known far and wide for teas. In this homeland of teas, all ethnical groups not only like to drink tea, but also have the habit of eating tea. Some communities of the Jinuo people are good at making mixed cold tea dishes. They will collect some young leaves from the tea plants in the space of the rain forest in the morning, cook them over the fire for about 30 minutes, fish them out, and mix them with salt, spicy pepper and fresh ginger, then drop some balm, add some garlic mud and mix them into a dish. This kind of cold mixed tea dishes are eaten together with sticky rice, they are faintly sweet and also have good aftertastes. In summer time, these dishes can help people to wipe out the inner heat; in winter, they can help people to get rid of coldness. In the International Tea Festival held in April of 1993, the cold mixed tea dishes were made by beautiful Youle girls beside the Peacock Lake of Jinghong; the cold tea dishes were presented to the tea experts from 12 countries and districts, after these distinguished guests tried the tea dishes, they all spoke highly of them. The custom of the Bulang people for eating tea is to make tea into a pickled vegetable, which has a unique flavor. The method for pickling it is as follow: collect the new sprouts and young leaves from the tea plants, spread them out in thin layers and shine them under the sun; after getting rid of water and the leaves are not so bright, rub them with hands; then, add some pepper powder, spicy pepper, salt and spicy ingredients and put them into a big bamboo barrel, press the tea tightly and plug the barrel opening with something; 30 days later, the tea will turn sour; 2 months later, the pickled tea can be served as dishes. The flavor of the tea is cold and sweet, and thus can be used as an appetizer. Pickling of tea is a method to keep tea fresh, and it can prevent the nutrition in teas, such as vitamin C, from being damaged in long term storage. Pickled tea is a traditional dish served on the wedding ceremonies and the festival occasions of the Bulang people. According to the introduction of a Japanese expert in the field of traditional food culture researches, there are also some villages reserve their custom for eating teas in Thailand and Japan; and this can also be deemed as a proof evidence that the Japanese people have close relations with the people in South Yunnan. 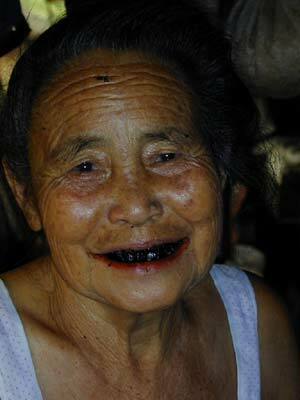 In the ancient Chinese documents, the Dai folks are addressed as "the tribes with golden teeth". Why do they have such a nickname? This is because they dye their teeth into black and red. Up to the present, the Dai and Bulang people of Xishuangbanna still have such customs. Besides, this also has relations with their habit of masticating betels. In the past, the young men and women of these ethnical groups liked to scrape the black ash and coat their white teeth with it when they grow up; in this way, and their teeth would become black or purple. Besides, some women also have the habit of masticating betel; they cut the betelnut fruits into thin slices, mixing them with ash and tobacco threads, pack them with piper betle leaves, and masticate them in the mouth. Sometimes, they cannot find any betels, then, they will use some young tree leaves for masticating. Why do these nations like to dye their white teeth into black or brown? It's said that they can fix and decorate their teeth in this way. They believe black and purple teeth are more beautiful and healthy than white teeth. Betelnuts have the function of driving away insects and tonifying the stomach. But we are not aware whether or not such habits have deeper and cultural connotations.